When his sixteen-year-old daughter goes missing, a young father discovers how little he knew of her online and personal life. First he discovers that she has no real friends, then that she has cancelled her piano lessons, then her correspondence through an online video site. Each step leads him to more discoveries. Through her social media, he discovers the place that she liked to go to be alone, and this information leads to the discovery of her car. While pursuing this lead, her father discovers that she has been spending secret time with his brother, her uncle. While confronting his brother, he receives information that the abductor has been found dead with a video confession uploaded just before his suicide. Preparing for her memorial service, her father makes one final discovery. The detective on the case has a connection with the perpetrator. They arrive just in time to find the missing girl alive! The twist is completely unexpected and powerful. The acting is superb and the story line is one that parents will find disturbing and eye-opening. The story is revealed using only laptop screens, phone screens, and computer screens in a way that enforces the film's message, but in no way inhibits the flow of the story. 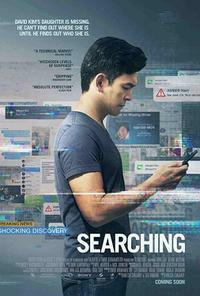 This telling of the story is very innovative and creative and sets the film apart from other missing-children movies. It also brings home the reality of how different a child's online persona may be from the one that a parent is familiar with. The suspense remains throughout the film and carries the father's emotions directly to the audience's heart. From hope to desperation, his feelings are obvious and raw and very moving. The story itself is filled with twists and turns that hinge on the information that her dad is discovering through his online efforts. The open, raw emotions are challenging at some points, but overall this is a great movie that every parent should see. *Contains moderate language and mild violence.